Coach Tour Operators in Greece represent a very important category of leading organized tourist offices that are capable of meeting all requirements of incoming and outgoing tourism. With totally updated fleets incorporating all vehicle sizes, from 25-seat coaches right up to 75-seat coaches, coach operator companies in Greece provide you with style, quality, reliability and the flexibility to meet your transport needs. With organized tours and sightseeing visits to all popular tourist and cultural destinations everywhere in Greece - Athens, Crete, Rhodes, Chalkidiki, Mykonos, Santorini, Cyclades, Ionian Islands, Kefalonia, Zakynthos, North Aegean Islands, Dodecannese Islands, Peloponnese and Crete –coachoperators take visitors on fantastic journeys to lands and venues that alternate with nature and culture. 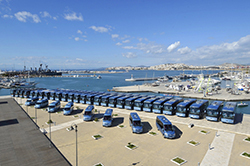 Coach Tour Operators in Greece run top coach travel, hire and bus companies, dedicated to offering a quality assured coach & bus hire & tour service. 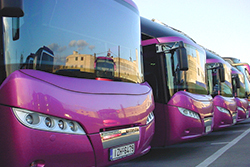 They strive to provide the very best service in bus and coach hire, with modern facilities to cope with all your bus and motor-coach hire requirements everywhere in Greece - Athens, Crete, Rhodes, Chalkidiki, Mykonos, Santorini, Cyclades, Ionian Islands, Kefalonia, Zakynthos, North Aegean Islands, Dodecannese Islands, Peloponnese, Crete. Whether you need a coach hire, holiday tour, school bus, motor-coach charter, bus tour, day excursion, or luxury executive coach hire there are plenty of coach operators to choose from in any location in Greece. From family weddings to music festivals, luxury hire coaches offer outstanding safety, comfort and up-to-date technology.